It’s no secret that injuries have ravaged the Ole Miss defense this year. In five games, the defense has lost both Jaylon Jones and Montrell Custis to season-ending ACL injuries and is easing Ken Webster back into the fold after he sustained a hamstring injury early in the season. Add senior defensive back C.J. Moore to this list. Moore, the captain of the defense, suffered a torn pectoral muscle in Ole Miss’ 45-16 loss to LSU. Safeties coach Jason Jones confirmed that Moore will join the ranks of Jones and Custis and will sit out the remainder of the year. “Talking to our trainers, it’ll roughly be a four- to five-month recovery,” coach Jones said. Moore’s injury deals a major blow to this already depleted Rebel secondary. Moore leads the team in fumble recoveries and is tied for the lead in interceptions. Statistical production aside, his veteran leadership will be missed most. 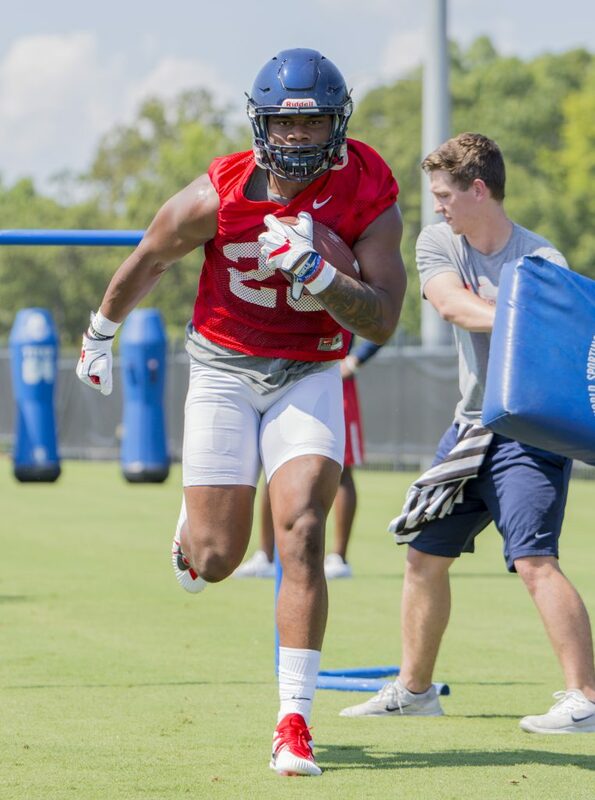 With numbers dwindling, the Ole Miss coaching staff is turning to two unlikely candidates to add depth to the defense: junior running back Armani Linton and freshman running back Tylan Knight. Linton, the 6-foot-2, 223-pound running back from Walnut, was actually recruited to campus as a four-star safety. He spent his first two seasons in Oxford on the defensive side of the ball but transitioned to running back this off-season. Though Linton hasn’t seen defensive action since the Mississippi State game last fall, coach Jones is optimistic about his prospects. Coach Jones expects Linton to play against ULM on Saturday. Knight’s case, however, is different. Knight, the 5-foot-6, 171-pound running back from Pearl, played on both sides of the ball in high school but was recruited strictly as a running back and slot receiver. Now, the kid whose only Power Five offer was from Ole Miss will get a shot to play defense in the SEC. Coach Jones delivered high praise for his undersized defensive transplant. While Knight’s move to defense may shore up some depth issues, his absence from offense may lead to unforeseen issues for the Rebel attack. Knight is second on the team in rushing, with 107 yards on 19 attempts, and has returned three kicks for 50 yards. When asked if Knight would play on both sides of the ball, coach Jones said the decision lies with head coach Matt Luke.